PLANET FGSD-1022 is an 8-Port 10/100Mbps Fast Ethernet Switch with 2 Gigabit TP/ SFP Combo interfaces, which boasts high performance switch architecture. The FGSD-1022 is capable of providing non-blocking switch fabric and wire-speed throughput as high as 5.6 Gbps, which greatly simplifies the tasks of upgrading the LAN for catering to increase bandwidth demands. Its two built-in Gigabit Ethernet uplink ports also offer incredible extensibility, flexibility and connectivity to the core switch or servers. 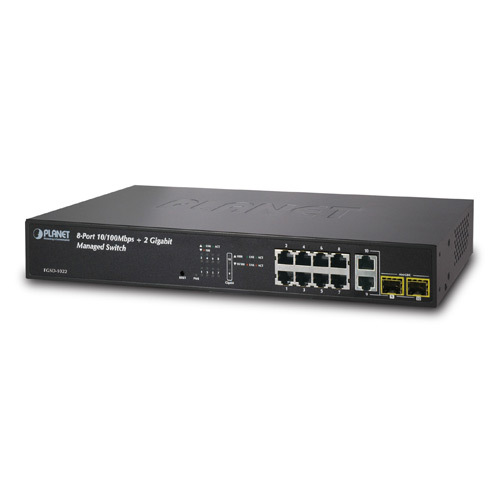 The FGSD-1022 can be programmed for basic switch management functions such as port speed configuration, port aggregation, VLAN, Spanning Tree protocol, QoS, bandwidth control and IGMP Snooping. It provides IEEE 802.1Q Tagged VLAN and the VLAN groups allowed on the FGSD-1022 will be maximally up to 256. Via aggregation of supporting port, the FGSD-1022 allows the operation of high-speed trunk to combine with multiple ports. A maximum of up to 8 ports can be assigned for 13 trunk groups and it supports fail-over as well. PLANET FGSD-1022 is loaded with powerful traffic management and QoS features to enhance services offered by Service Providers. The functionality includes QoS features such as wire-speed Layer 4 traffic classifiers and bandwidth limiting applications that are particular useful for multi-tenant unit, multi business unit, Telco, or Network Service Provider. It also empowers the enterprises to take full advantages of the limited network resources and guarantees the best performance in VoIP and video conferencing transmission. For efficient management, the FGSD-1022 is equipped with console, WEB and SNMP management interfaces. With its built-in Web-based management interface, the FGSD-1022 offers an easy-to-use, platform-independent management and configuration facility. It supports standard Simple Network Management Protocol (SNMP) and can be managed via any standard-based management software. For text-based management, the FGSD-1022 can be accessed via Telnet and the console port. Moreover, the FGSD-1022 offers secure remote management by supporting SSL connection which encrypts the packet content at each session. PLANET FGSD-1022 offers comprehensive Access Control List (ACL) for enforcing security to the edge. Its protection mechanism also comprises Port-based IEEE 802.1x user, Web Authentication user and device authentication. The Port-security is effective in limiting the number of clients passing through so that network administrators can now construct highly secured corporate networks with considerably less time and effort than before. The two mini-GBIC slots are compatible with 1000Base-SX/LX and WDM SFP (Small Form Factor Pluggable) fiber-optic modules. The distance can be extended from 550 meters (Multi-Mode fiber cable) up to 10/30/50/70/120 kilometers (Single-Mode fiber or WDM fiber cable). They are well suited for applications within the enterprise data centers or distributions data link. The FGSD-1022 connects up to 8 workstations in the Ethernet environment, in which its two SFP Mini-GBIC interfaces uplink to a department backbone. Moreover, the Switch provides 5.6 Gigabit per second switch fabric and high bandwidth for backbone connection. In an MTU/MDU application, the advanced functionality of the FGSD-1022 eliminates traditional issues associated with the use of Ethernet. Users can be separated with advanced VLAN functionality to enhance security. The flexible Mini-GBIC 1000Base-SX/LX module options make the FGSD-1022 one of the best and most cost-effective Switch solutions for multi-tenant service providers. With the mini-GBIC 1000Base-SX/LX SFP (Small Factor Pluggable) interface, the deployment distance of the FGSD-1022, a high-performance edge device for FTTx solutions, can be extended from 550 meters (multi-mode fiber) up to above 10/20/30/40/50/70/120 kilometers (Single-mode fiber). To build a network solution of FTTH (Fiber to the Home), FTTC (Fiber to the Curb) for ISPs or FTTB (Fiber to the Building) for enterprises, the various distances of SFP (Small-Form Factor Pluggable) and Bidi (WDM) transceivers are optional for customers. For security applications, the 8 copper ports can be configured with VLAN settings and connect to different units like offices, houses and departments. Port Status Display each port’s speed duplex mode, link status and flow control status. Auto negotiation status, trunk status. 2012-09-07 1.2 Release for FGSD-1022HP hardware version 2.0.